Cefn Croes was earmarked for wind power in the 1990s, and an anemometer mast appeared there in 1998. The planning application for the power station itself was submitted in 2000, and approved in 2002. Construction took place in 2004-2005. At the time of completion, Cefn Croes was the most powerful onshore windfarm in Wales. 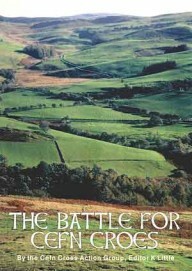 THE BATTLE FOR CEFN CROES is a 196-page book (ISBN 0-954 5341-0-7) detailing events between 2000 and 2003. The limited-edition print-run of 100 has been distributed, but the book is also available on this website. Click the book cover above to read.